Finding the right solution for a company’s operations can be complex, especially when the needs are very custom. At IntelliFinishing, we offer unique solutions for powder coating systems which can be designed to meet any specific needs or requirements. One of our biggest differentiators is flexibility. Our friction-driven conveyor and smart controls deliver just that. We work with customers in many different industries and want to share with you a specific story of our work with JR Custom Metal Products, a Wichita, KS-based metal fabricator. Several objectives were driving JR Custom Metal Products’ need for a new powder coat solution. They were looking to increase the quality of the paint finish for their customers. Their existing process, which was outsourced, granted the company no control over quality, often requiring considerable rework. Further, outsourcing was proving to be extremely costly, coming in at over a million a year, with slow lead times that were impacting operations. Dealing with a great variety in part sizes, JRCMP also wanted to be able to deliver the highest quality coatings based on their own values and to better meet customer turn times. With no control over quality or delivery timing, it was time to bring operations back in-house and build a system customized to their unique needs that allowed for more cost-effective processing. Jorge Martinez, Vice President of Sales and Marketing at JR Custom Metal Products, said, “Once we made the decision to build a powder coat finishing line, we wanted to do it right.” Doing it right involved a lot of research and time to find a seamless solution to the challenges they were facing. JR Custom Metal Products required a very customized solution for powder coating because of different part sizes, thicknesses, and process times. 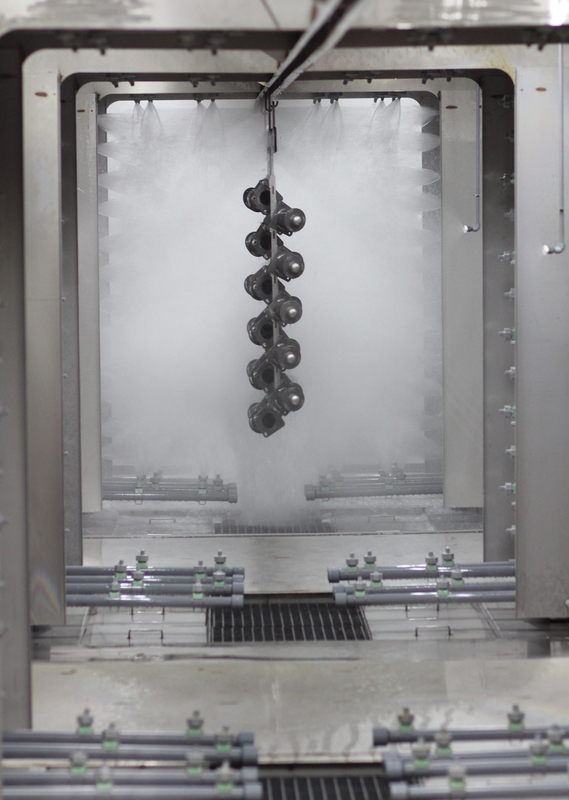 They also needed to have the ability to stop for manual processes at the shot blast blow off platform, a de-watering station, a masking area, and for the powder coating application, while minimizing any quality defects that could occur with operators stopping the conveyor or extending manual process times. Further, they required an optional path to an automated in-line blast system. After a four-year process of investigation, attending PCI, FabTech, and peer group meetings where they talked with a variety of vendors and visited numerous sites with systems in place, JRCMP first chose Midwest Finishing Systems to build their system, but as their needs were explored, MFS brought in IntelliFinishing. JRCMP was particularly intrigued by IntelliFinishing’s unique flexibility, especially the cutting-edge conveyor system which was also incorporated into the design. To meet all of JRCMP’s requirements, IntelliFinishing created a plan to make powder coating easier and more convenient without compromising on quality. As parts are loaded onto the carrier via load bars (custom designed by JRCMP themselves), the operator enters or selects the paint process recipe for that particular batch of parts. The ability to define, edit, and store recipes is a huge milestone for the process, determining exactly how parts will flow through the system. With a recipe-based system, each part or set of parts can receive a custom process. Once the recipe is entered, the parts either go to an automated shot blast for cleaning or move straight to the automated part washer. If it runs through the shot blaster, it does so at the speed defined by the recipe. Heavy parts may move through the blast at 5 fpm, while lightweight parts can be sped up to help minimize the profile at faster speeds such as 10, 15 or even 20 fpm. For especially difficult parts, a recipe option can include backing the carrier up to blast the items twice. Items then move into the automated wash that includes three stages and a dual halo final rinse of either RO water or a sealer coat. After washing and blasting, the parts stop at the blow off platform to remove any remaining water before entering a highly efficient dry off oven. 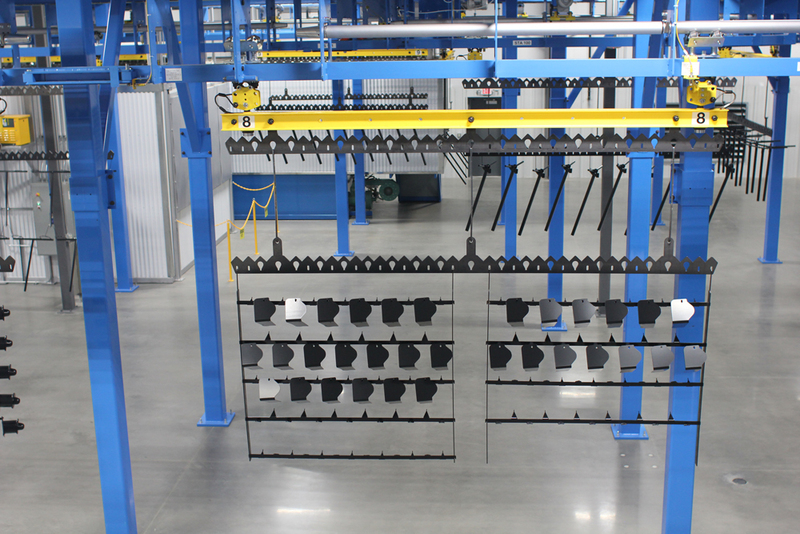 In the dry off oven, parts are heated to evaporate any water residue before powder coating. Again, items may have different dry off times based on substrate and complexity, ranging from just a few minutes to 20 or even 30 minutes. From the oven, parts are directed to a temperature- and humidity-controlled environmental room. Next up is the masking platform. This station features an HMI (human machine interface) terminal that can access specific masking instructions based on the parts arriving at the platform. As with all of the HMIs, operators can also see the entire system overview and the ability to drill into any carrier to determine present status, recipe selections, and order/part data. The operator masks each part, then they continue onto the powder paint booth where two painters apply powder paint to the parts. Once completed, the load bar releases the parts to the dual lane oven for curing, boasting 6” insulated walls to eliminate unnecessary heat loss. Having two lanes allows faster curing parts to move past slower curing parts, thus maintaining a higher level of throughput than traditional systems. After curing, parts proceed down the conveyor to the unload station where they are unloaded for packaging and shipping. In this final step, IntelliFinishing customized the space between the oven and the unload station so that the parts have a sufficient amount of time to cool down before operator handling. Today, JR Custom Metal Products are experiencing optimized operations and agile processing. Bringing the process back inside, rather than outsourcing, has increased part control for the company, improved quality, decreased costs, and accelerated customer delivery timelines. 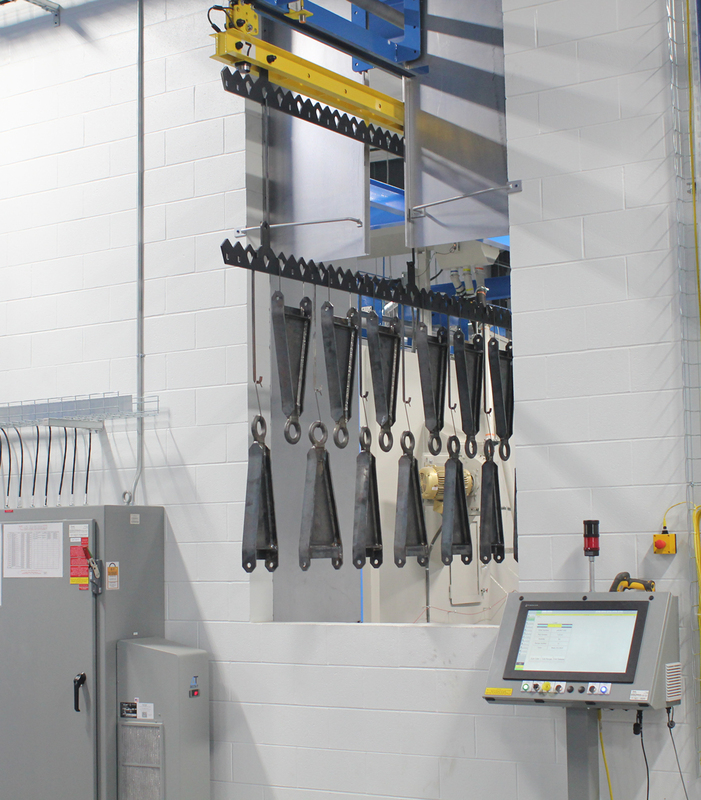 Unlike other non-sustainably designed powder coating systems that use overhead monorail conveyors typically limited to parts of one size and no variation in processes, JRCMP’s new system provides optimized flexibility in both part disparity and process customization. Further, for each load bar recipe process, data is collected and stored. From varying speeds through a process, or parts moved quickly through areas where no processing is required, having access to each unique recipe improves quality, consistency and throughput for similar parts that require analogous processing in the future. In addition, JRCMP users can easily manage the conveyor, equipment, processes, and recipes from three HMI terminals. With an evolving need to process different size parts and recipes, JR Custom Metal Products turned to IntelliFinishing to provide a solution that allowed for flexibility now and adaptability in the future. Their new system provides maximum control and unparalleled customization, creating significant efficiencies that have increased throughput and decreased bottlenecks while ensuring a higher-quality end product for years to come. Learn more about how IntelliFinishing helped JR Custom Metal Products by watching a video featuring their facility. 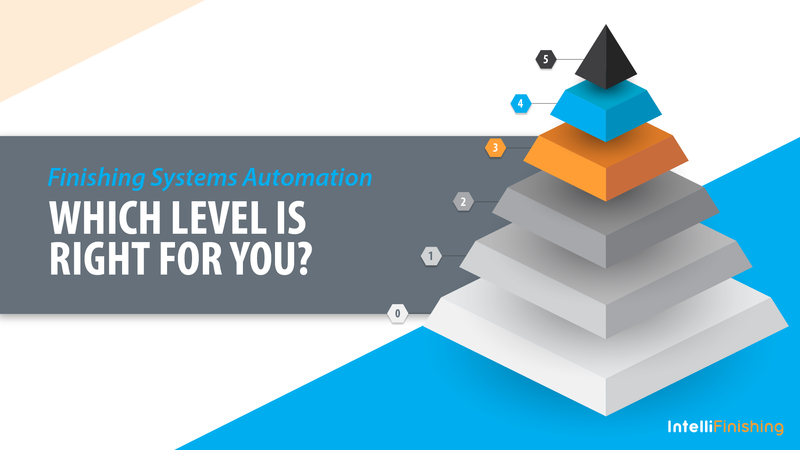 Finishing Systems Automation: Which Level Is Right for You? Automation is an integral part of any manufacturing facility, making operations smoother and more cost effective. Increasingly, next-generation finishing systems are expanding automation capabilities, allowing for efficiency, flexibility, and scalability in correlation to an operation’s requirements. In fact, there are up to five levels of automation that you can achieve in terms of historical, existing, and future systems, including the Internet of Things (IoT) devices. Let’s look at each level of automation to dive deeper into these processes. At this level, there is really very little automation, requiring almost complete operator intervention. Many conveyorized finishing systems still operate at a hardwired level of control. These include some new systems, but also, many existing systems that may be years if not decades old. These systems tend to lack flexibility and the ability to adapt, but are very robust and durable. At this level, there is limited automation, and most electricians would be able to troubleshoot an issue should one occur. This level still requires a lot of operator intervention and can be costly to design and build. In fact, the use of mimic panels for automated finishing systems is quite uncommon. At level two, you will be able to automate most processes or simple systems using basic PLC (Programmable Logic Controllers) control systems. Replacing relays with PLCs adds flexibility (easier to make changes) and enhanced reliability in a smaller package, providing increased functionality while reducing the overall cost to design and build. With simplified computer screen operator features, electricians trained on the equipment would be able to troubleshoot many issues. However, specialized controls programmers/engineers may be required to set up or change the PLC programming. Typically associated with the control of process items like washes and ovens, this level is very prevalent among most existing finishing systems. Some Power and Free conveyor systems are also controlled by the PLC and HMI set up. With PC-level computing and operation functionality, automation opportunity increases here, including data collection and storage capabilities. Further, at this level, the integration of smart automation is possible for tasks like recipe control. There is an added expense in maintaining automation at this level due to more sophisticated control programming. However, efficiencies are gained due to simpler operation, more flexible part processing, increased reporting, and a significant reduction in manual operation. While not common in most finishing systems as of yet, many companies are moving to level 4 automation for other areas of their industrial facility—especially larger OEMs. At this level, companies are leveraging the newest software capabilities to connect the plant floor to the boardroom suite. This level starts to unite traditional Operational Technology (OT) with Informational Technology (IT). Often, companies initiate level 4 by standardizing system and locational OT processes around a unifying industrial software solution. There are fewer software programs to maintain, but software modification or unforeseen problems will necessitate the services of expert technicians and programmers. These systems are designed to collect and access data as well as to be deployed over multiple processes or facilities for consistency, quality control, and benchmarking/data analysis. The base capabilities of some software platforms at this level can include reporting and system operation to unlimited operator terminals, the ability to handle unlimited data points (tags), and connection to an unlimited number of other software databases such as ERPs, MES, etc. This level offers robotic automation for processes and conveyance. Robotic use implies the minimization of operator engagement. Robots are often deployed in the paint booth itself for both liquid and powder systems, but they are also used to load parts on to or off of finishing systems. Typically, articulating arm robots are used for these tasks. However, reciprocating spray systems in booths, washes that adjust to part dimensions, blow off tunnels that focus in tightly on parts based on their geometry, as well as other aspects of automated systems are also forms of robotics. To make changes or troubleshoot robots, a programmer or someone trained in the robot’s specific controlling software is usually necessary. Robots can also be controlled in conjunction with the entire finish system HMI control as part of the recipe control. The system can also collect data on the robot’s performance. And with software control, the robot operation can be replicated across multiple applications, processes or locations. To discern what level of automation is right for your plant, there are several considerations to ponder. What is most important in your finishing processes? Improved efficiency of people and equipment? Faster turn on finishing products? Enhanced finish management and quality control? Improved system flexibility to coat a wider assortment of different parts and materials? Increased overall visibility of operations for managers and executives? Preventive maintenance at the right time to significantly reduce unplanned downtime? You should also look at historical operational data. Decisions are often driven by reliability, the integration of safety features, product rates, capacity expansiveness, the level of operator intervention that will work best, remote connection for data and support, as well as the possible integration of third-party equipment. The level of automation must also align with the variety of pieces being finished. With increased part complexity comes the need for a highly flexible finishing system. In these situations, higher levels of automation and versatile recipe control make the most sense. Cost is also an important consideration. While automation initially represents significant outlay, it offers rapid ROI based on lower operational expenses and improved quality. However, there are some “hidden costs” related to automation. These include the need for programming and employees skilled in the respective software, downtime due to normal computer vulnerabilities, increased demand for back-up of system data and redundancy, and operator training. Ultimately, having a programmer to keep the software running smoothly should help to save on troubleshooting or expensive outsourced programmers. Conversely, with higher levels of automation software, predictive maintenance is possible so there should be less overall unplanned system downtime. These modern advancements will generate even more data to be stored and shared, allowing operators to make better decisions that improve the efficiency and effectiveness of finishing systems. To some extent, it will also require even greater abilities for data managers to consolidate data, report metrics in impactful ways, and employ even more sophisticated system analysis and diagnostics. IntelliFinishing is a complete finishing systems provider that combines smart technology with our revolutionary modular conveyor for the most flexible finishing system available. This fusion of advanced engineering and progressive technology allows individual sections of the conveyor to move independently in both speed and direction, as well as to control each process via one unifying operational software that allows for per carrier recipe flexibility. A variety of manufacturers use our systems for a best-in-class finishing process. Experience it today by watching the system in action. 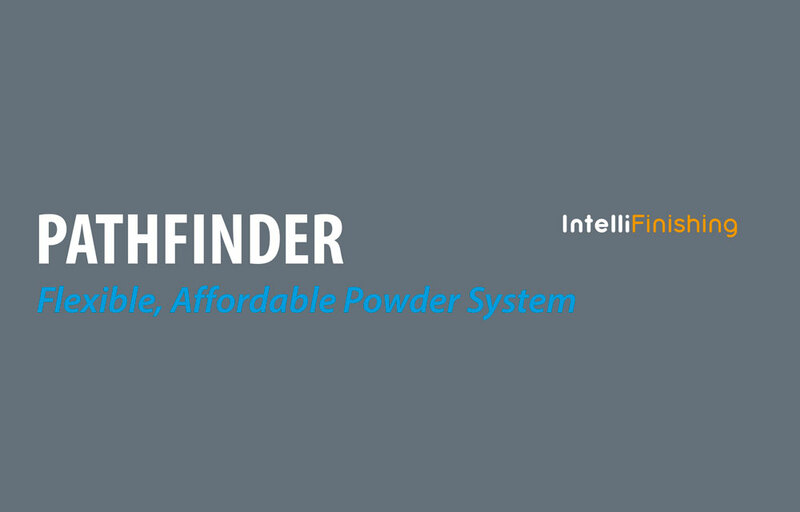 John Claman, IntelliFinishing & Kasa Controls Sales & Marketing Supervisor, discusses how IntelliFinishing provides flexible finishing solutions for powder coating and liquid paint.